Leo Orchid is like a colorful present for those you love. 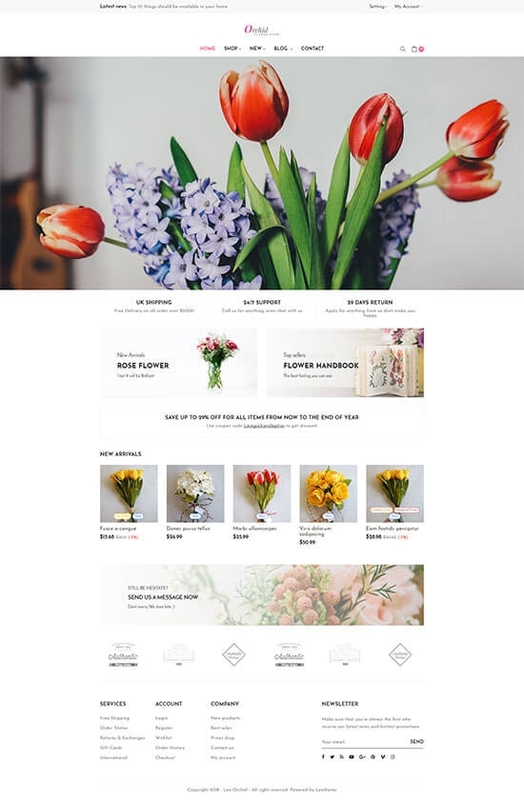 A clean and minimalist Leo Orchid Responsive Prestashop Theme can be a perfect starting point to create a great basis for any flower online store. This theme always looks beautiful on any type of devices like desktop, computer, tablet or mobile phone as the theme is 100% responsive based on Bootstrap 4 Framework. First of all, Leo Orchid is stressed by the centered logo and horizontal Megamenu, and the Full-screen Sliders created by Leo Slideshow module. The sliders and banners will represent for your web-promotional part, which helps you focus visitor’s attention on your special offer once reaching your site, especially for the upcoming Valentine’s season. The clear and lightweight header thanks to Block group top module that combines language and currency functions in one block will impress your web-visitor right at the first look. 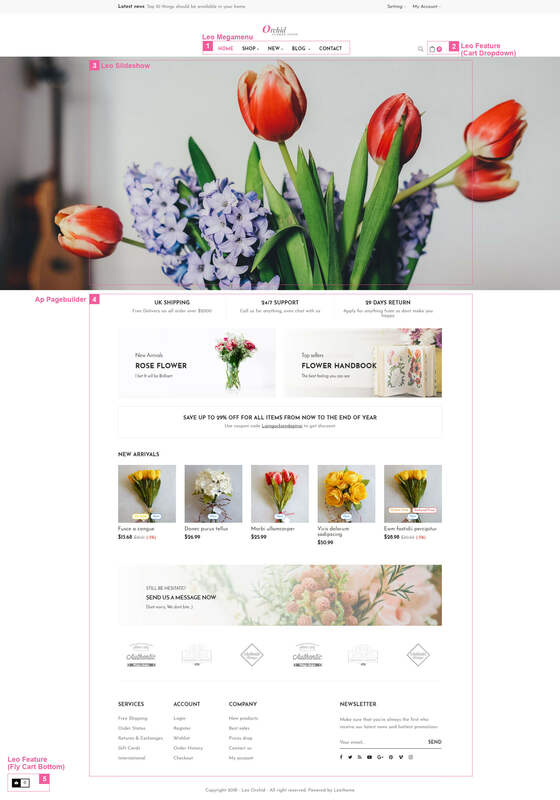 Importantly, built on the best Prestashop framework and Ap Page builder module, Leo Orchid is supported with more than 20 widgets like widget image, product carousel, manufactures carousel, HTML, etc, which allows you to create as many profiles as you want, and change the interface or config to drag and drop in Backend easily. Also in the content area, items are supplied with hover effect, add to cart, add to wishlist, QuickView, and Fly cart. These functions of Leo Feature module are built and developed by Leo Theme to give user’s experience more satisfying and convenient. 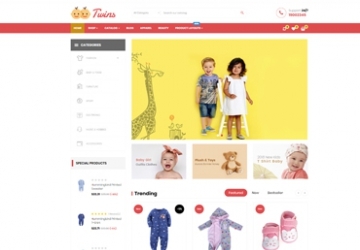 The on-site purchase of your customers will become more interesting thanks to the fly effect, which makes the product smoothly fly to the cart after each click on Add to Cart button. 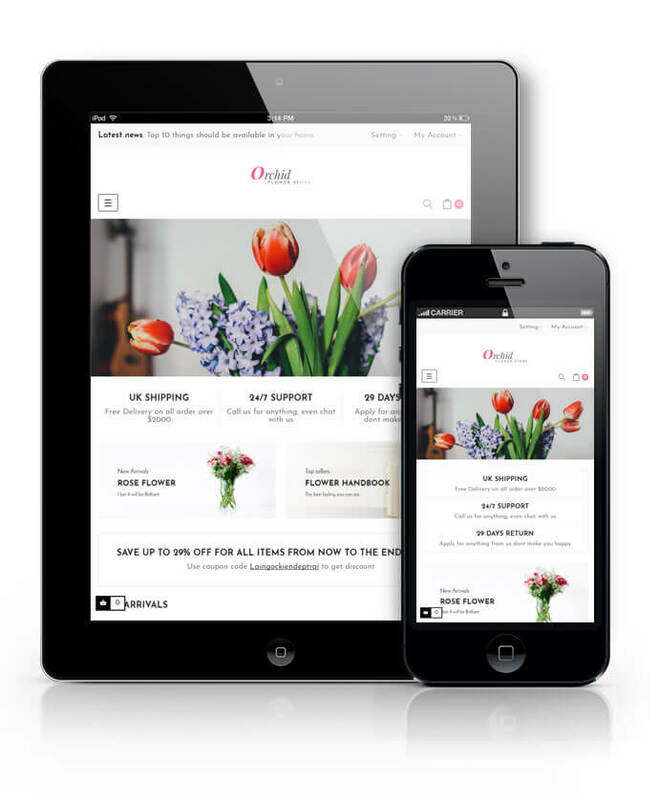 Last but not least, Leo Orchid is informative with the Footer that is supported by Widget Block Link, enable you to create links like shop’s services and information unlimitedly or social networks to track your site too. 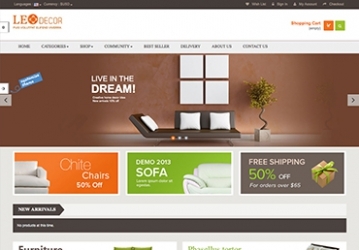 The Leo Orchid Responsive Prestashop Theme for diversified commodities.